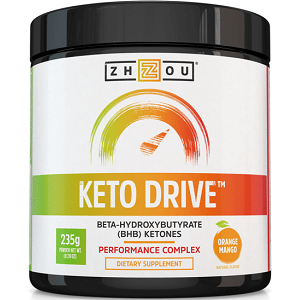 One of the supplements you might be considering when looking for exogenous ketones is Zhou Nutrition Keto Drive. But you need to know if it’s a worthwhile supplement to take, or if there are better ones to try. We’ve taken a look at the ingredients and the customer support that this manufacturer offers to answer this question for you. The calcium, sodium and magnesium beta hydroxybutyrate salts are ketone salts – meaning that they have a mineral component, like the calcium, magnesium and sodium; and a ketone component which is the beta hydroxybutyrate. The minerals can be used for normal processes like muscle contraction and relaxation, while the ketones cause a complete metabolic shift in the body. High levels of ketones in the blood cause the cells in the body to metabolize fat. The metabolism of fat releases more ketones. Ketones are used by muscle cells and brain cells as a source of energy and they have been shown to improve overall energy usage in these cells. We’re not entirely sure why the manufacturer included vitamin A in this supplement but we do know that it helps to perform a lot of the important functions in the body, like its role in the immune system and vision. One serving should be mixed with 16 oz of water and the mixture taken on an empty stomach. This can be done up to three times a day. When starting to use this supplement, a serving should be about half a scoop and you should move up to a full scoop as you begin to use it more. There shouldn’t be any adverse effects when taking this supplement, but users must not exceed the daily dosage as then toxic effects may occur. Pregnant and breastfeeding women should consult a doctor before taking this supplement. Anyone taking chronic medications should also be careful of interactions and would also benefit from consulting a healthcare professional. A container of 8.3 oz of the supplement can be purchased online for $58.97. This price does not include shipping. However, this manufacturer offers a subscription service in which customers get 5% off their orders and free shipping. This product is satisfaction guaranteed for 60 days. If a customer is unhappy for any reason they can contact the customer support and the manufacturer will issue a refund. The guarantee applies for one container per customer. There are some well considered ingredients in this product and the manufacturer offers a decent guarantee. The price of the supplement is a bit high but the manufacturer does offer a discount for subscription. What we have found is that there are other manufacturers who offer larger discounts when ordering in bulk which far surpass this supplement’s discount, so although this is an adequate supplement there is a cheaper option available. John Parker	reviewed Zhou Nutrition Keto Drive	on October 11th	 and gave it a rating of 3.